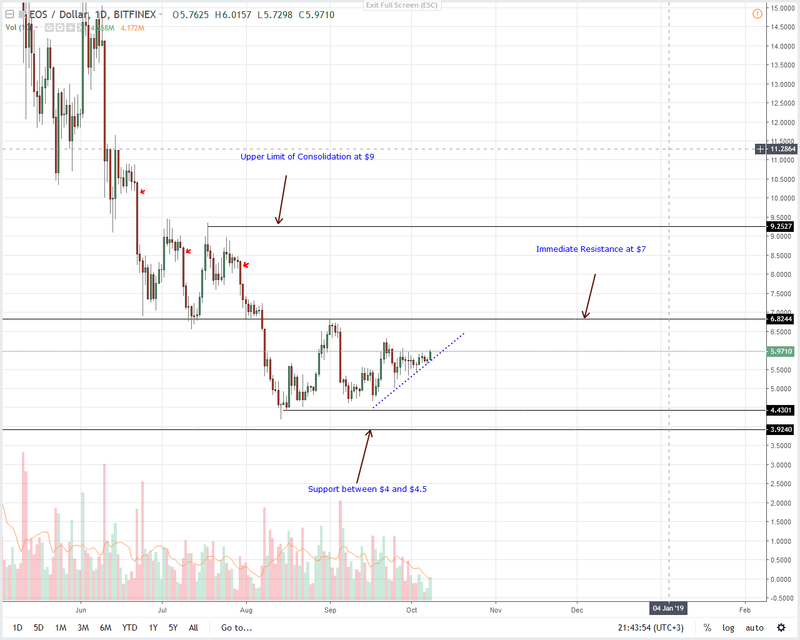 Odds are altcoins are likely to fly off from their main support. With most registering gains in the last day, prices are now inching above key resistance trend line with Tron for example trending above Sep 2018 highs. As a result, bulls are likely to dominate and the same might pan out in IOTA thanks to the last three days of consistent higher highs. The pluses of EOS mutability and block producers prevented a $12 million EOS heist according to a report. While the topic of mutability is controversial, it works both ways because in essence BPs upon consensus do create new transactions and not reverse transactions on-chain. 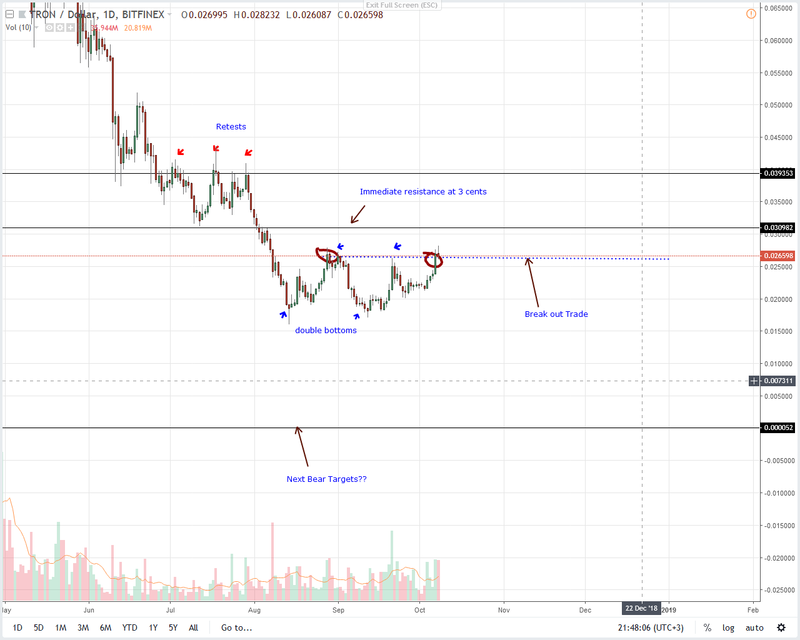 Price wise and EOS is the top performer bouncing off our main support trend line and edging closer towards $7. Overly, we retain a bullish outlook mainly because of the last two bull candlesticks rejecting lower lows. Secondly, it’s because of the deep correction of price from 2017 highs that makes it kind of “illogical” to liquidate at spot rates. Needless to say, yesterday’s revival means our last EOS price analysis is valid. As such, gains above $7 will automatically trigger buyers eyeing $9 and later $15. In a direct endorsement of Lightning Network, Charlie Lee the founder of Litecoin said “LN is Satoshi’s vision.” Lightning Network or (LN) is an off-chain scalability solution that enable fast settlement and complete decentralization. 6/6 Bitcoin with Lightning Network more closely fits the Bitcoin whitepaper's title: "A Peer-to-Peer Electronic Cash System." This is Satoshi's Vision. The solution is also possible in Litecoin and through submarine and atomic swaps there is better network utility and efficiency. Back to price action and LTC is stable, up three percent in the last day. This rejection of lower lows is positive for investors and could build the necessary impetus for rallies above $70. In line with our previous highlights, conservative risk-averse traders should only enter “longs” once there are gains above $70. But, considering yesterday’s higher highs, we suggest risk-off traders to load at spot rates with stops at $55. 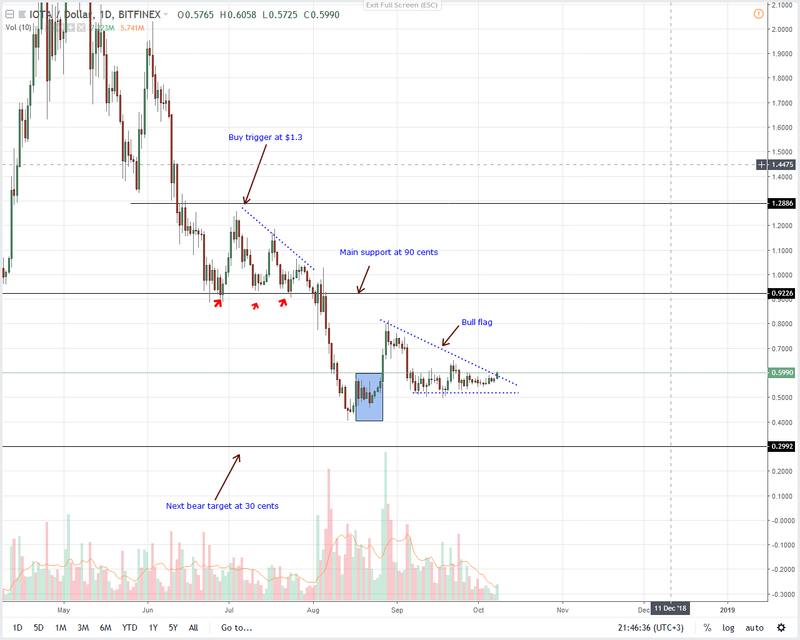 That’s around Sep 14 lows and minor support line in our Litecoin price analysis. All things constant, our last trade plan holds because moves below $55 invalidate this projection. Considering the consolidation of the last few weeks, Stellar Lumens prices are still held within a wedge. But, that’s not all. Thanks to the ranging market, Sep23 high low is acting as a perfect confinement for price action. 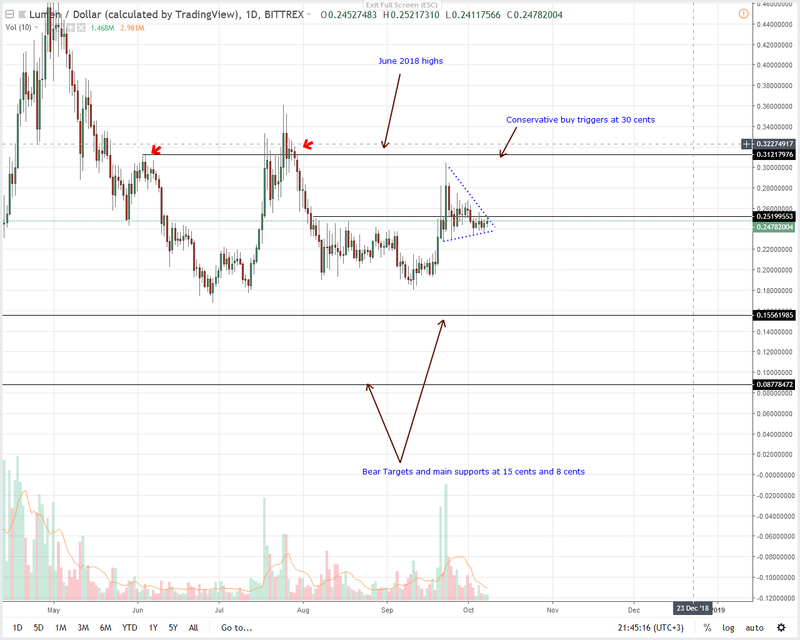 Moving on, our previous XLM price forecast is true and for now, yesterday’s two percent gain mean risk off traders can enter at spot rates with stops at 22 cents once there are decisive moves above the bull flag. From the last two bars, this could print today triggering short term buys with targets at 30 cents. Thereafter, conservative traders can begin realigning entries depending on the strength of break outs and consequent retest of the 28 cents—30 cents resistance zone. 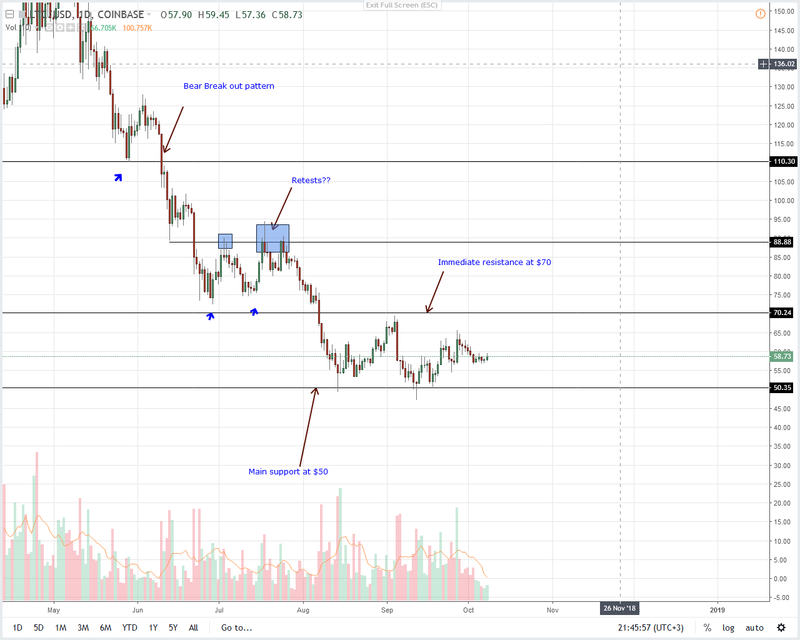 Thanks to a 13 percent surge, TRX traders can begin loading at spot rate or in pull backs in lower time frames. This is so because of Justin Sun announcement of TVM Odyssey update. 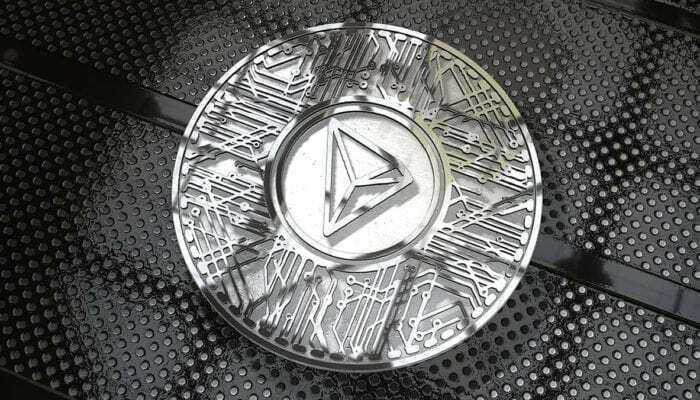 After Odyssey 3.1, Justin said “TRON Committee function & TVM will go live, marking the start of the Smart Contract Era” boosting prices and expectations as a result. We expect Sunday’s momentum to pad buyers aiming at 3 cents in days to come. What will keep this going is the shill from Sun saying the update will make Tron 100 time cheaper than EOS and 200 times faster than Ethereum. From the chart, it’s a straight buy for traders. Backing this outlook is Oct 7 thrust and close above Sep highs marking the beginning of a bulls. Because of this rally, we suggest risk-off traders to load at spot prices with stops at around 2.5 cents with targets at 3 cents. In the meantime, risk-on traders can buy after conclusive, high volume closes above 3 cents in line with our last TRX trade plan. After a six percent addition in the last day, IOTA is only $300 million away from reclaiming its number 10 spot. Gauging from price momentum, that is likely to print out this week. More so if there is a strong and a relieving break out above the bull flag. Considering the higher highs of the last few days, odds are, we might see that happening today. As such, we suggest risk off traders to buy at spot as they take advantage of a break out trade with targets at 90 cents. In the meantime, risk-on traders can begin taking trades once bulls garner enough momentum closing above70 cents triggering long trades as a result.